OMD’s 1984 album Junk Culture enjoyed a curious period of writing and hopping from studio to studio. With their creative batteries exhausted by Dazzle Ships and their confidence deflated by criticism of the 1983 album, Andy McCluskey and Paul Humphreys decided that a change was needed to draw out inspiration once again. The pair retired to Highland Studios based in Inverness to begin the process of conjuring up new OMD material. Having worked with kit such as the Emulator (essentially a keyboard that relied on a library of sounds and could sample new ones), their imaginations could be let loose in a series of experimental works – including the track that would later become ‘Junk Culture’. Another early Junk Culture song to emerge during the Inverness sessions was ‘All Wrapped Up’, an emotive track that described jealousy and possessiveness in its lyrical content: “Stop going round, with the girl that I love. She’s already taken, she’s all wrapped up”. 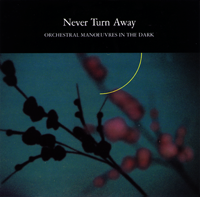 ‘All Wrapped Up’ joined several other new OMD tracks, including ‘Heaven Is’, ‘Tesla Girls’, a track that would later become ‘Never Turn Away’ and ‘The Avenue’. Following a series of small gigs to trial the new songs, the band moved on to The Chapel studio on Lincolnshire where they brought in Brian Tench to produce the new material. By this stage, ‘All Wrapped Up’ had been rearranged. The drum sequence had been stripped right back and replaced with isolated percussive fills. Meanwhile the music box effect of the original melody had been transformed into a more muscular bass-orientated synth sound. The song had also been topped off with a sax solo from Martin Cooper towards the end. The band moved on to mixing at Mayfair Studios in London where they also began writing new material. At this stage they were angling for a single release (with ‘Tesla Girls’ being the obvious choice), but Virgin insisted on the band completing the album first. Flying to Air Studios in Montserrat, the band began the process of recording and completing Junk Culture. During this hectic period of recording and writing new songs, there was a definite change of style for OMD who were being influenced by a variety of music that was popular on Montserrat, including soca and reggae. With this in mind, the band overhauled ‘All Wrapped Up’ once again adding boasted bass guitar and steel drum effects., As a result, the track, now titled ‘Wrapp Up’, had much more of a groove to it. Post-Montserrat, the band moved to Brussels and then Hilversum in Holland to complete the album. The idea of getting a fresh input on production on the album was discussed – which is where legendary producer Tony Visconti came into the picture. Visconti felt that the material was largely fine as it is, but contributed brass arrangements to both ‘Locomotion’ and ‘Wrapp Up’ (which had now reverted to its original title of ‘All Wrapped Up’). A local trio of brass musicians Jan Faas, Jan Vennik and Bart van Lier were brought on board to record the arrangements, which led to the version of ‘All Wrapped Up’ that appears on Junk Culture. 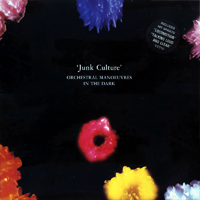 In late 1984, while OMD were busy taking Junk Culture to Europe for live shows, the 4th single from the album was decided upon. ‘Never Turn Away’ was actually the last track to be given a title from the Junk Culture album – in fact it was named only a week after the album was completed. With the original version of ‘All Wrapped Up’ existing in a more or less completed state, it seemed to be a good choice for a B-Side track to accompany ‘Never Turn Away’. OMD’s then-manager Gordian Troeller is credited for mixing the track, which was now titled ‘Wrappup’. It was rare for OMD fans to be able to contrast and compare two radically different versions of the same song (although ‘Messages’ from 1980 is probably the earliest example). ‘Wrappup’ also served as a reminder of how Junk Culture changed from its original incarnation as a classic-sounding OMD album with traditional electronic composition, through to the funked-up rhythms of the completed album.